For two months, the adopted ministers of Davao Mission did intense groundwork in preparation for the crusade given by Professor Allan De Silva of Maryland, USA. 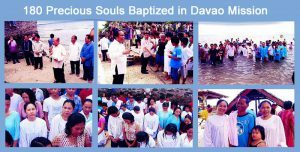 The crusade was the reaping campaign, which culminated with 180 precious souls baptized (42 of them in Riverdale SDA Church and 138 in Seagull Beach Resort). Some of the adopted ministers continue to nurture the new baptized brethren while others are giving bible studies and doing house-to-house visitations. Please pray for us and our work for Jesus. We thank everyone for your prayers and financial support. Share Him- Global Evangelism with 14 dynamics Students – foreign evangelists from Oakwood University and 2 faculty members (Dr. Samson and Mr. Kenny) and 1 team leader- total of 17 people – came to Romblon Adventist Mission to do evangelism. Three days before the SHARE HIM team arrived, the Mission President called the adopted ministers for briefing of the coming SHARE HIM Crusade. All the adopted ministers of RAM had to do quick work in the 17 sites – churches of Central Tablas District including Southern Tablas of Romblon Adventist Mission. We learned a lesson during the SHARE HIM crusade; we could have harvested more souls if we were well prepared and had planned well. Unfortunately, we were told only at the 11th hour about their coming. After the SHARE HIM crusade, we are doing follow-ups for the hundreds of interests who attended the SHARE IM Crusade. Please pray for our work.